“The Return of the Killer Robots”—sounds like the title of a bad sci-fi movie! But The New York Times (June 17, 2014) reports the dangers that robots pose to the humans who work alongside them, documenting at least 33 workplace deaths and injuries in the U.S., a number may well understate the perils ahead. 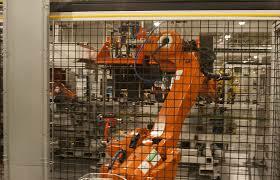 Until now, robots have largely been used in manufacturing, particularly in the auto industry. They have mostly been “dumb robots,” designed for repetitive tasks that are dirty, dangerous or dull. But the robots whose generation is being born today collaborate with humans and travel freely in open environments where people live and work. They are products of the declining cost of sensors and improved artificial intelligence algorithms in areas such as machine vision. The Baxter robot, which does repetitive jobs in workplaces like packaging small items, is designed to sense humans and stop before coming in contact with them. It also has a display screen that cues those who are nearby about what the robot is focusing on and planning to do next.